A felony is a criminal offense for which a convicted person can be sentenced to serve one or more years in prison, pay fines or both. In California, felonies encompass a wide range of offenses, from non-violent crimes such as petty theft to violent crimes such as murder. Felony charges are quite serious, and come with life-changing consequences. Even the lightest felony conviction can ruin many aspects of everyday existence, limiting employment, housing opportunities, denial of certain professional licenses, and deterioration of your quality of life for years to come. In California, a felony conviction may fall under the Three Strikes Law. Under California Penal Code section 667, repeat offenders face increasingly elevated punishments. The “Strikes” are generally, but not exclusively, violent or serious felony convictions. Regardless of whether you are facing one, two or three strikes, it can put you in serious legal trouble, facing incredibly harsh punishments should you be convicted. If you have two strikes and are convicted of a third, “Three Strikes” comes into full affect, and you will automatically be sentenced to 25 to life in prison without the possibility of parole. In California, most felonies are punishable under the Determinate Sentencing laws. This means that if you are convicted of a felony offense and sentenced to prison the judge may impose 1 of 3 prisons terms, ranging from low, middle to high. The term that is imposed depends on many factors. In California, certain crimes can be prosecuted or charged as either a misdemeanor or as a felony. These charges are called wobblers, and depending on how a crime is charged may be the difference between prison time and probation. It is possible however, to avoid jail completely and arrange for an alternative sentence in lieu of jail. 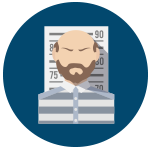 Your attorney can be the greatest single factor in determining the outcome of your felony conviction, and can be the difference between you serving time in jail or not. Whatever your case may be, contact The Law Office of Jimmy Cha to discuss your case immediately in order to find out more about your case and what possible defenses there may be.